A few years back I got to know James and Koso and they gave me enough information to make a informed decision in purchasing the IDL-12 they use to make. Quite frankly I didn’t know what to do with it when it arrived. I opened up the box and pulled out a small square box with insignia on all six sides. It felt a bit heavy. I read the protocol instructions and there was a good many to choose from. When I saw the “Psychic” protocol to make one open his or hers psychic centers I decided this is what I will practice for the next 30-60 hours of one hour training. On my weekends I was able to do two (one hour) training for two days, so I had four hours each weekend and one hour each weekday for a total of 9 hours a week, 36 hours a month! It seemed to me a good plan to reach my first thirty or so hours to see what happens. And happened it did! James and Koso always emphasized that once in that area of specific hours synchronocities just materialize out of thin air. Before I had the “Need” it was already manifested! I was becoming “Psychic” each and everyday. I wish I could take credit for this on my own but that would be a lie! 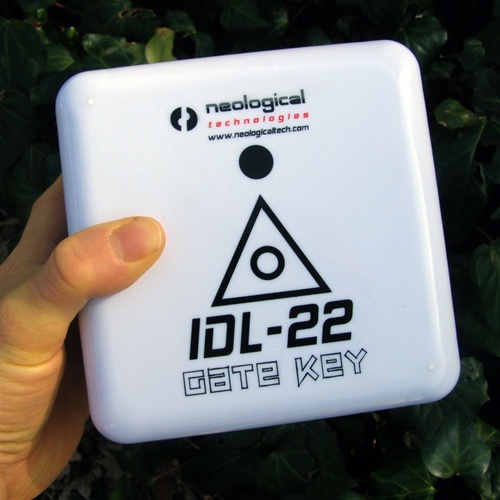 I have to the give credit to my IDL-12 it was this device that made it all happen to us. Within about my 50th hour of training pretty close to 7 weeks or so, I thought I give myself a well deserved break from meditation and just watch some T.V. and read a good book. Which in fact that is what I did. My wife went to sleep on me and I crawled in to get some sleep as I was laying their running over in my mind everything that had happened to us since reaching that 30 hour mark, I must have dozed off but it didn’t last that long. As I was sleeping I was awakened by a female voice saying, “Honey, come out into the living room”. I barely could open my eyes and I tried once more to listen to whom I thought was my wife at the times calling for me. I got no other reply so I fell back to sleep and once again it said, “Please come out into the living room”! Ok, Ok, I am getting up, thinking my wife couldn’t sleep and she needed company until she got sleepy enough to go back to bed. I manage to stumble through the hallway and out into living room. When I open my eyes fully looking around for my wife she wasn’t there! All that was there was our furniture a dark room and my IDL-12 sitting on the coffee table where I last used it. I shook my head and headed back to bed, once I entered the bedroom I saw my wife sleeping under a pile of blankets. She was a sleep! Then who and the heck called for me? I laid back down and fell asleep quickly, only to be disturbed one last time, again the female voice said, “Come out into the living room!” So I quietly tipped toed to the living room only to find the same thing. I sat down on the sofa and picked up my cube and said, “I guess it was you calling for me, wasn’t it!” It gave no response…So I set the alarm for one hour and took about 10 minutes or so repeating the protocol instructions what I wanted from the opening of the star-gate. After the alarm went off, I went back to sleep once more and no more female voices for the rest of the night. I told my wife what happened but she didn’t hear anything. Over time I figured out what was happening, my IDL-12 set up a telepathic link to me and wanting me not to skip the one hour mediation. You remember before on my first time using the device I was using the Protocol for Psychic Enhancement, well it was working! So we had both synchronocities and psychic communication going on all at the same time. Some may ask, do you trust James: My answer would be “Yes”! Does the IDL’s really work or is it imagination: Definitely Works! Is it worth the high cost: My question back to you would be, what are you worth! Here is the thing, if you ever envied true psychics and I am not referring to 1-800’s either, and you envy their skills at remote viewing and walking and talking in other dimensional worlds, you no longer need to be envious, because using James’s NEO will actually get you there in a hurry. But you must be willing to put a minimum of one hour everyday and the time of day is up to you, just put in that required one hour. Nothing comes free in this world or the next! When your hungry you feed yourself but when the spirit is hungry some of us starve ourselves! That energy body in us, like it or not is here to stay as long as you can breath the breath of life. It too is starving for it’s food! But it can only be fed with the same substance that your energy body is made up of. Meditation is that substance and with the IDL-Neo’s you can get your spiritual food all in one place. Then watch what happens when it’s fed! I want to reach that goal of 256 hours! I called this my Master Achievement Level I. Of course every 256 hours would be the next upcoming level (s).